At ProBank Austin, our goal is to create a solution to meet the specific goals and requirements of your financial institution. As such, we have designed LoanPricingPRO to be as flexible as possible to meet the diversity of client needs. 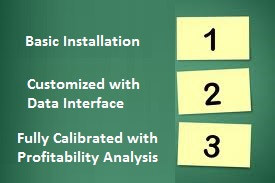 There are many different configuration options and choices as it relates to the set-up of the system for your institution. Each LoanPricingPRO option includes deliverables that allow you to choose the depth of service, the level of accuracy, and the pricing package that best fits your institution. As a comprehensive provider of both loan pricing and profitability solutions, we have a range of service offerings unparalleled by any other provider in the marketplace today, ranging from basic loan pricing services to full customer, product and branch profitability systems. See our Services page for a more complete listing of configuration choices.